Deenna is a certified professional groomer and instructor with experience in nearly every breed and size. Below, Deenna and Savana answers some of the questions new customers typically ask: Welcome Savana! 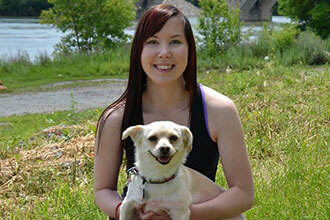 Savana is a certified groomer with over five years of experience in the animal care industry. She received her training through the Apex Grooming Academy in Regina and is comfortable with all breeds. She is trained and passionate about geriatric and special needs care, which allows her to properly groom and handle these unique animals. Her main focus when grooming is safety and comfort, and she understands that every animal's needs are unique and grooms with a patient and gentle approach. We love pets!! That may seem obvious, but it's easier to do a great job when you love what you do. Our grooming philosophy is "patience and praise". This means that we take the time to ensure your pet is relaxed and comfortable prior to the start of the grooming process. Our unhurried and gentle manner continues until your pet is delivered back to you. This approach, coupled with the use of a premium grooming products and equipment, allows us to deliver a premium service in every aspect. It really is about less stress on your pet and less stress on you. With two mobile salons, we can offer a convenient and exclusive one-on-one grooming service. Do I need to be home for my pet's grooming appointment? While some owners prefer to be home, it's not necessary.We are trained to ensure the safety and security of both your pet and your home. This is another convenient way to get your pet groomed such that you can go about your daily routine worry-free. Give us a call for further details. What if I have two dogs/pets? Do I pay the service fee for each pet? We will only charge one service fee per visit per family. However, multiple dogs from neighbours or friends at the same location will each be charged the service fee. What if I don't have a place for the trailer to plug in to? No problem. Our WagginWheels Mobile Pet Grooming salons are completely self-contained and powered. Do you come to apartments or condominiums? Absolutely. All that is needed is a level place to park the salon near the building. We love cats and have been fully trained in cat grooming. Sometimes they can be difficult to handle and require appropriate measures to ensure the safety of your pet. Check out our rates in "Our Services" and give us a call to discuss your specific needs.